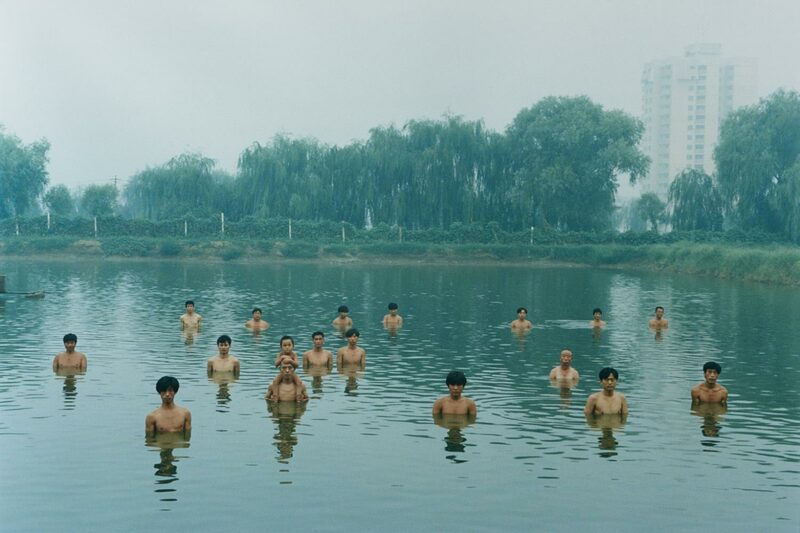 This photograph documents a performance piece in which the artist persuaded an anonymous group of rural day laborers to stand in a shallow pond in Beijing Park. Their action here is a literalization of a Chinese saying to the effect that one person cannot make a difference in a larger environment. However, it appears that Zhang Huan does not accept the maxim, for this gathering of individuals must, by the laws of physics, have had an effect on the overall level of the water. The exercise exudes an aura of futility; the participants look outward impassively at the artist and, by extension, at the viewer. In 1997 in Beijing, Zhang Huan persuaded a group of rural day laborers, who represented China’s broad worker migration from the countryside to the city, to stand in a shallow pond in a park, thereby elevating the water level. A seemingly futile gesture whose inefficacy is reinforced by the impassive expressions of the anonymous participants, the photograph nonetheless documents the presence of these new urban inhabitants, and demonstrates the unavoidable effects of bodies upon one another. It also points up the inextricable links between ideas and things. Peter Barberie, from Philadelphia Museum of Art: Handbook. Philadelphia: Philadelphia Museum of Art, 2014, pp. 412–413.